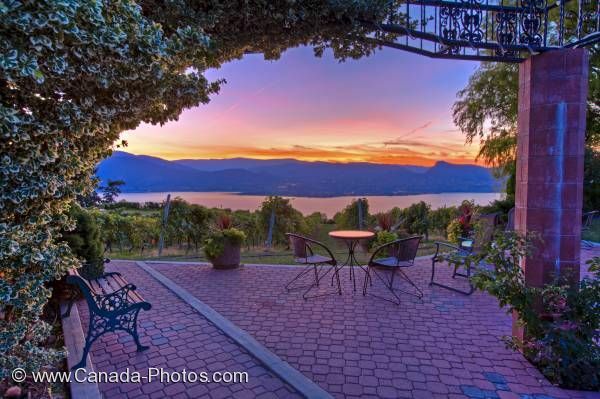 A cobbled outdoor patio close to Naramata is the perfect place to sit surrounded by a vineyard overlooking scenic Okanagan Lake at sunset while sipping on a glass of wine. This romantic sunset setting is in the town of Naramata situated on the shores of Okanagan Lake in British Columbia, Canada. Sunset over Okanagan Lake viewed from the patio at Lang Vineyards, Naramata, Okanagan-Similkameen Region, Okanagan, British Columbia, Canada.